Most people assumed that this meant we were going to see Morales in season 5 of The Walking Dead, which is currently on its midseason break. Again, he’s still alive, and it wouldn’t be the first time the show has brought in a blast from the past. Merle (Michael Rooker) came back after being gone (but we all knew he would), and Lennie James’ Morgan has popped up a time or two recently, apparently tracking the main group (we still don’t know exactly what’s going on there). So it wouldn’t blow our minds to see Morales show up. 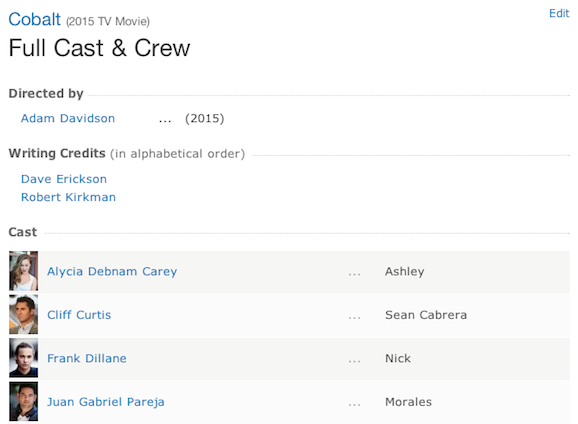 But according to IMDb, Morales is going to be a part of Cobalt. Here’s a screen shot of the cast list, which doesn’t even include the most recent addition, Kim Dickens, who won the job as the female lead. The real question is how Morales is going to be a part of the spinoff. There could be a connection between Morales and some of the characters from the new series, though Cobalt takes place in Los Angeles and Morales and his family start their journey in Atlanta. They could have made their way from coast to coast, but that’s a long journey, especially early on, when everything was still totally fucked up. It’s also possible they made it all the way from Atlanta to LA after leaving the group, but if the spinoff is indeed set earlier than the flagship series, he won’t show up for quite some time. Then again, this is all just an unconfirmed rumor at this point. It’s actually easier to imagine Morales showing up back in The Walking Dead than Cobalt. He left, but he’s familiar with this group, and he, like Morgan, has a walkie-talkie, so perhaps he could be following them in a similar manner. Right now, this is all based on wild conjecture. It’s not uncommon for IMDb to have things wrong, especially at this stage in the process. And like I said, Dickens isn’t even on this list, so who the hell knows how accurate it is. This also seems like a strange choice. Producers have said they don’t want to share characters, and Morales never had a ton of personality, and it’s not like he was hugely popular or anything, only appearing in a handful of episodes. What do you think, is Morales coming back? Do you think we’ll see him on Cobalt? Do you care at all? Also, what happened to those former gang members who stayed behind to care for the people who could not escape Atlanta? I know there was a deleted scene that showed their demise but since it’s deleted it’s non-canon right? *Yawn* Dear Giant Freakin Robot, as far as I can tell Avengers and the Marvel Cinematic Universe are every bit as scifi (if not more so) as weekly horror soap opera that you insist on constantly having stories about. Please cover more scifi and less horror/drama. I will happily take more Star Wars rumors and anything Trek, Marvel or even DC over this drivel in my daily scifi news scoop. Thanks.